Even though I'm constantly sharing pictures and recipes for delicious, not-so-healthy-looking food while simultaneously eating and drinking my way through the Cleveland restaurant scene, the truth is my diet revolves around green smoothies and salad most of the time. So boring, but, unfortunately, so true! I'd be lying to you if I said I don't get sick of it, so I'm always testing new combinations of ingredients to spice up my everyday, non-blog post meals. 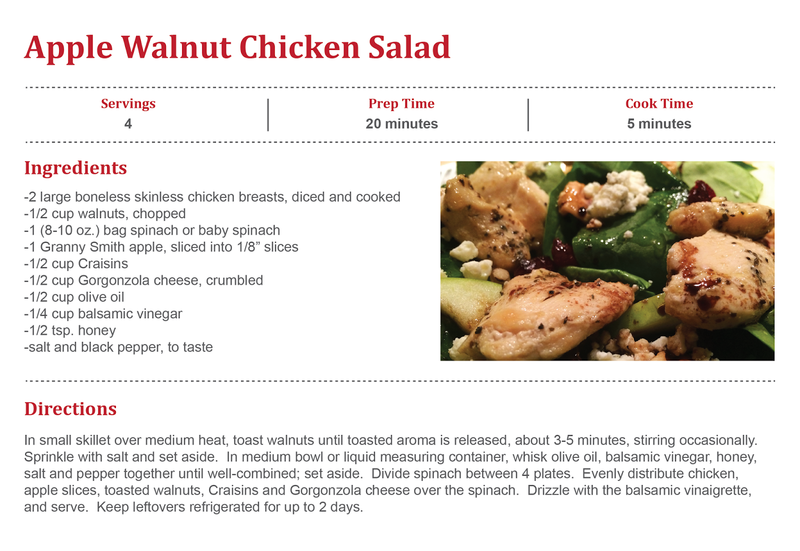 I came up with a gourmet salad recipe last week with ingredients that I always have on hand: chicken, spinach, granny smith apples, walnuts, and Craisins. I even splurged and bought a little Gorgonzola cheese to crumble on top for some extra flavor. 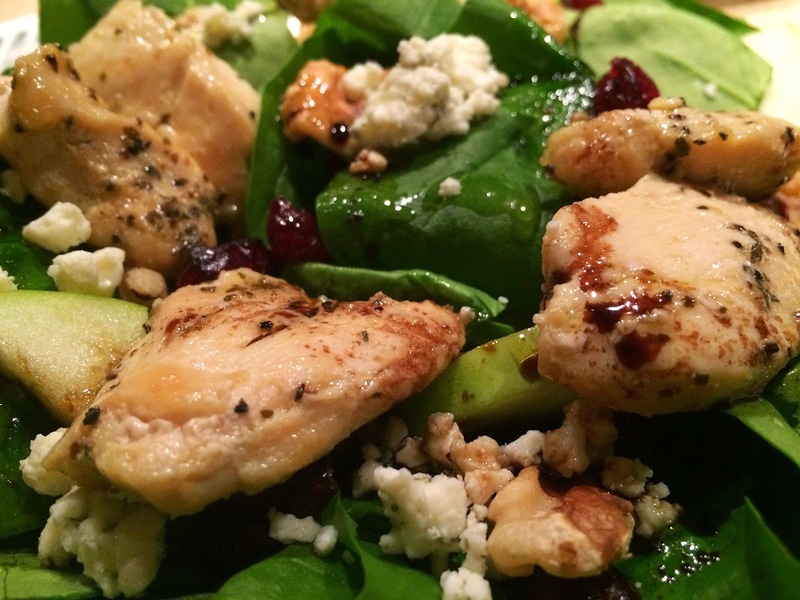 Serve it with a homemade balsamic vinaigrette, and you have a super healthy meal that tastes like it's restaurant quality! Feel free to use any type of chicken you have on hand for this recipe. I sauteed diced, boneless, skinless chicken breasts seasoned with a little salt, pepper and garlic powder over medium heat until they were cooked through. Nothing fancy, just prepare the chicken to your liking. While the chicken was cooking, I toasted the walnuts in a small skillet over medium heat. There's no exact science to the toasting process, I just wait until the aroma of the walnuts fills the room, then they're done. Be sure to keep your eye on them while they toast because they can go from raw to burned in a matter of 30 seconds. Take the walnuts off the heat as soon as you can start to smell them cooking, and sprinkle them with some salt for a little extra flavor. At this point, the chicken is still cooking, so I whip up my own vinaigrette. You can obviously substitute a store-bought dressing for the homemade, but it only takes 1 minute to prepare and tastes so much better. I also love being able to know exactly how much salt, oil, etc. go into what I'm eating. I whisk olive oil, balsamic vinegar, honey, salt and pepper together, and it's done. I distributed the ingredients evenly among the plates, and served with a drizzle of the balsamic vinaigrette over the top. See, aren't you glad you made this tonight so you can splurge on french fries and beer tomorrow night? Shhh I won't tell!